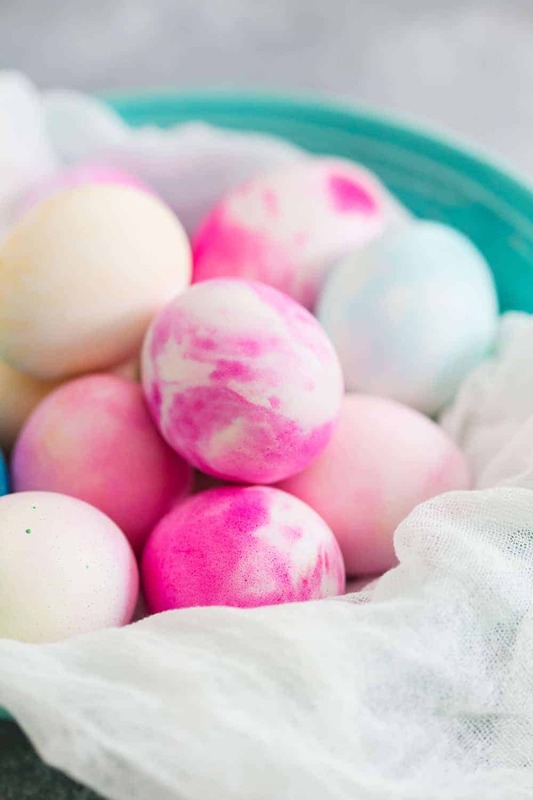 Whipped Cream Dyed Eggs are super simple and so much fun. This is a project you can get even the littlest hands involved in, and everyone will have a blast. I promise! You guys, I seriously can’t deal with preschool germs anymore. I swear, every single time we get over something (umm, hello strep throat!) something else takes us out. By us, I mean Elle and me, because my husband apparently has the best immune system in all the land. I seriously don’t think he’s been sick in over five years. Being sick is obviously for the birds, but it’s even worse when the weather is actually decent enough to go outside. I’m talking sunny blue skies and 45+ degree temps. Which may not seem very warm to you, but to many Ohioans, it equals shorts and flip flops weather. Unfortunately, Elle had to watch all of her neighborhood buddies play outside this weekend while she was stuck indoors making clay crafts and watching way too many episodes of Daniel Tiger. You seriously know you’ve seen one too many episodes of Daniel Tiger when you start singing about your feelings in the car when someone cuts you off. Mind you, I was alone in said car. So I totally could have yelled a few choice words, but nope, I sang DT – TO MYSELF. And since I tend to cuss quite a bit, I feel like this is a total win in the parenting department – if only she’d been there to hear my good behavior! Going crazy, you guys. I’m going. Crazy. I haven’t been baking or cooking very much, aside from a delicious loaf of chocolate chip banana bread that I’ll be sharing later this week. Blackening bananas were the driving force there, otherwise it wouldn’t have happened. We did, however, manage to unearth the Easter decor bin from the depths of the storage room, so I feel somewhat accomplished by hanging a festive wreath on my door and replacing my welcome mat. Ever since we pulled out the decorations, Elle’s been wearing her bunny ears headband and asking about dyeing Easter eggs. Every year we end up picking up one of the adorable kits from Target, of course. They’re typically complete with the cute stickers to transform the hard boiled eggs into animals or very odd looking human characters and little dye tablets that you mix with water and vinegar. 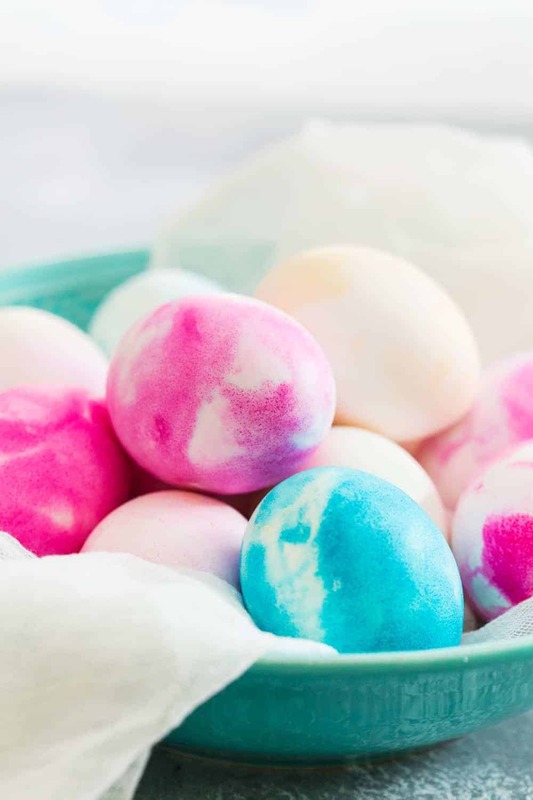 But we also like to make a batch of whipped cream dyed eggs because they are easy peasy, and so fun to make. And they’re SO beautiful! You’ve probably seen this same technique around the internet, but using shaving cream instead of whipped cream. And while that definitely works, we actually eat our eggs, and the thought of consuming something that rolled around in a bowl of Barbasol just doesn’t sound all that amazing. I mean, can you even eat those? I certainly wouldn’t want to. Eggshells are porous! 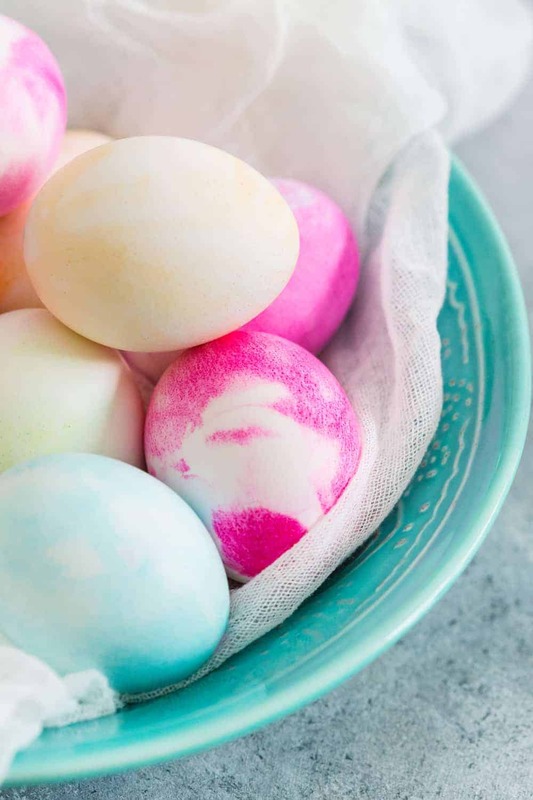 The great thing about these whipped cream dyed eggs is that they only require a few ingredients: hard boiled eggs, whipped cream and food dye. Gel or liquid works just fine. Since we’ve covered the dye, let’s chat whipped cream. If you want to whip the cream yourself, go for it. 3-4 cups should do the trick. I actually use a large container of Cool Whip, because it’s less expensive than heavy cream, and I don’t have to dirty my stand mixer. And since we’re not actually eating the whipped cream, just the whipped cream dyed eggs, I go for the cheaper option. But you do you. Now, let’s talk about technique. 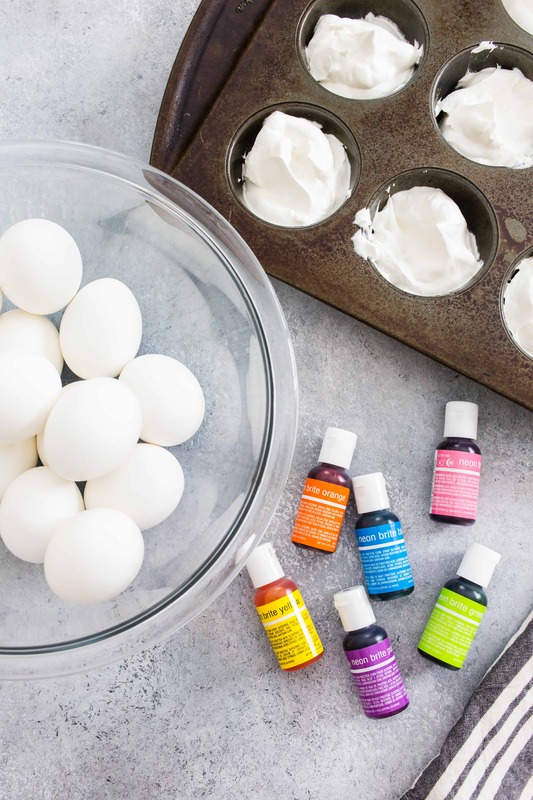 You can put the whipped cream or Cool Whip into a 9×13-inch baking dish and swirl the colors around to create a tie-dyed effect on your whipped cream dyed eggs. Or you can use a muffin pan to keep the colors separate. Totally your call, I love them both ways. I love the gorgeous patterns that result from this technique, and they’re always a big hit in the Easter hunt. 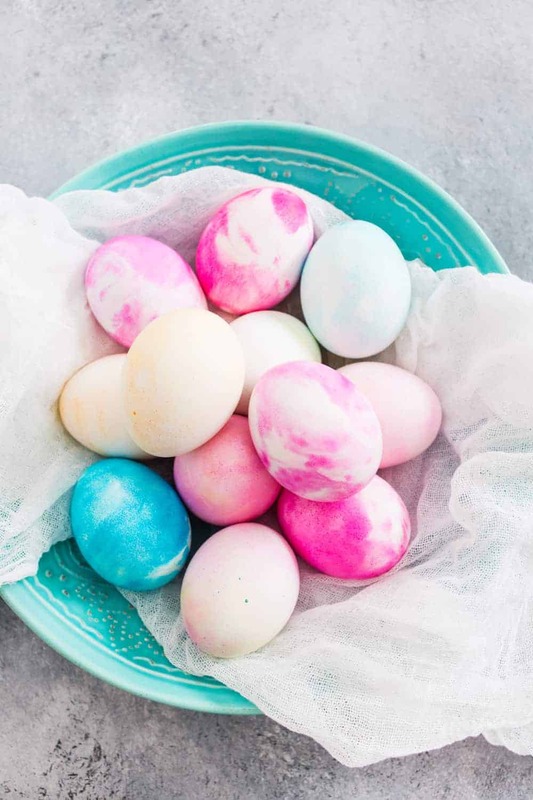 Be sure to also check out these naturally dyed eggs and some of our more classic egg decorating ideas, too. No matter how you make it festive, I hope you love decorating eggs as much as we do! Bring on the chocolate bunnies. Spoon whipped cream into a 9 x 13-inch baking pan. Alternately, you can partially fill each well of a muffin pan with whipped cream. Use the muffin pan technique if you want to keep the colors separate as shown here. Use the 9 x 13-inch pan if you want to swirl the colors together for a tie-dyed effect. 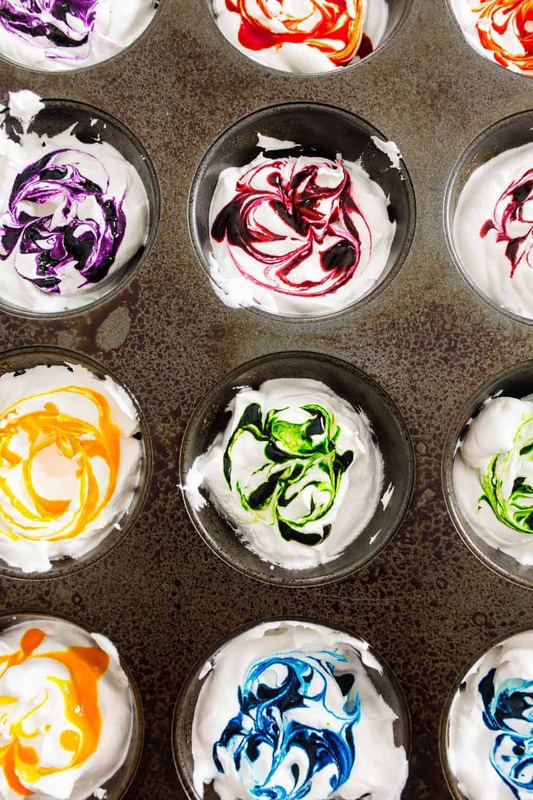 Add drops of food coloring to the whipped cream and use a toothpick to lightly swirl the colors into the whipped cream. Don’t swirl too much, or you’ll lose the beautiful marbleized look and muddy up the colors. Place the eggs into the whipped cream and gently roll using a spoon so the entire egg is covered. Let the eggs sit in the whipped cream for 30-45 minutes depending on how bold you would like the colors. Put on a pair of disposable gloves, remove eggs from the whipped cream and rinse them with water. 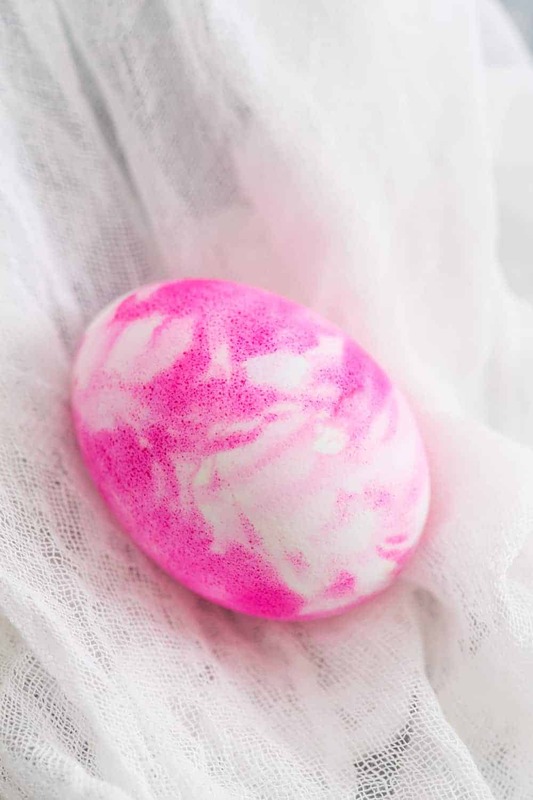 Allow the eggs to dry on a paper towel, this will help absorb any excess dye. If you’re making your own whipped cream, you’ll need to whip 3 cups of heavy cream. This post originally appeared on My Baking Addiction In April of 2014. The text and photographs have been updated. Much thanks to SpendwithPennies.com for the great idea! That looks really cool! I will have to mention this to my nieces because they will love this! Thanks so much! Let us know if they try it, and how the eggs turn out! Have a great day! This looks cool! Going to try this one out this year, last year we dripped food coloring on eggs in a colander and swirled them around with a little vinegar, this looks more fun for the kiddo. :-) Thanks! That sounds pretty cool too, I bet turned out great! Have a fantastic day and please stop back and let us know if you experimented with this technique! I LOVE this idea! And no vinegar….YAY!! Totally going to give this a whirl. Sounds great! Please stop back and let us know how they turn out! This looks like so much fun! I’m going to try this with dollar store shaving cream!!! That’s great! Stop back and let us know how it works with the shaving cream. Have a great day! Wow! these eggs are beautiful, love the method you used, so unique. These eggs look lovely!!! Just one thing, what do you do with the remaining whipped cream? Do you throw it away? Thanks so much! And, yes the remaining whipped cream should be thrown away, there is way too much food coloring in it for it to be used for anything. Have a great day! Thanks!!! And also thank you for sharing so many ideas and recipes!!! Very clever idea. Thanks for bringing it to us in time to do for Easter. Question – how much whipping cream did you beat to fluffiness to fill that glass pan? How many eggs did it cover? I used two of the small cardboard heavy whipping cream containers, which I believe are pints. It was more than enough for a dozen eggs. When the first batch of eggs came out, I could have reused a large amount of the whipped cream. Thanks so much! Thank you so much! Have a wonderful Easter! Thank you for posting this! I’ve been looking for a way to dye eggs with my 2year old without vinegar and i know he’ll have fun with this and not get bored! You are so welcome! It’s really fun! Stop back and let us know how they turn out! Have a great day! I have put rice with a few drops of food color in a container with a lid. Add the egg and shake. They turn out speckled. We do this in my toddler room. this looks fantastic and my kids will definitely love this method. may i ask, do i have to peel the eggs before dying or just leave the shell on them? thanks as always! Thanks so much! 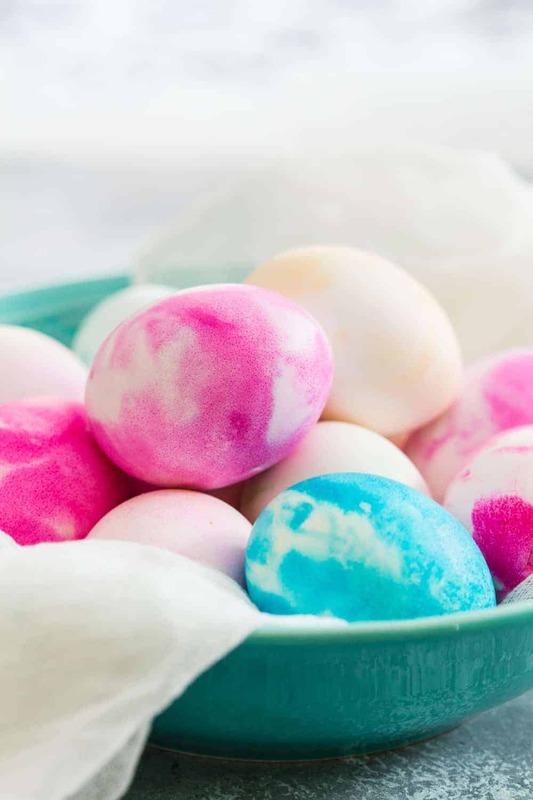 Just place your hard boiled eggs with the shells on, in whipped cream/dye! Have a fantastic day! I tried it today and at first I was super unsure because my mixture had a more brownish look but the eggs turned out perfectly! :D http://instagram.com/p/m-uf0JLTpX/ thanks for sharing! They look beautiful! Turned out great! Thanks so much for stopping back to share the photo! My son and I tried this last night and had a lot of fun with it. everyone has loved the results as well! Thanks so much for posting this so others could enjoy without the vinegar smell! Is there a video of this recipe?,coz i’m a bit lost in the instruction! Hi, Trosen! Unfortunately, there’s no video…is there a specific point in the dyeing where I can help you out? Let me know! Hi, Maree! I wouldn’t recommend using eggs that aren’t boiled. I think they may be too delicate and would break during the dyeing process. I hope you enjoy it! Did it really still work with no vinegar? I saw that you had to soak the eggs in vinegar for 2 minutes or add some to the food coloring. We made our exactly as described in this post. Thanks! 1. The acid in the vinegar bath allows the color to adhere to the egg much better and more vibrant! Oh no! I hope everything gets better. And let’s hope that this crazy cold Ohio weather warms up sooner rather than later. On a happy note, these eggs are gorgeous. So I think you skipped the where you to soak the eggs in white vinegar for about 5 minutes prior to putting them into the colored whipped cream. Once you do that, they only need to sit in the whipped cream for 5-10 minutes. Hello! I didn’t use that method, but I have heard it works really well. Thanks for stopping by! So glad to hear you like the idea! I hope you give it a try! Thanks so much for stopping by!